Strangford Lough in Northern Ireland is much like Port Phillip Bay in Melbourne - it holds a vast volume of water, and the tidal current at the narrow mouth is very fast flowing. 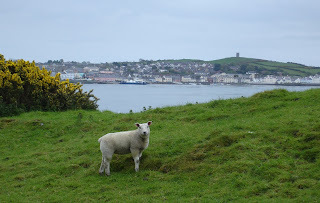 We took the car ferry (visible on the far shore above the sheep) from Portaferry to Strangford. The incoming tide required the ferry to point seawards at perhaps 70 degrees off its direction of travel across the entrance.